The other day I was perusing the potted herbs selection looking for a thyme plant for my (future) herb garden but there were so many varieties, it was very confusing. Lemon thyme, lime thyme, caraway thyme, wooly thyme, garden thyme? For someone like me who knows nothing about plants or gardening, having so many options is just too overwhelming. I later found out that there are over 300 different species! Thyme originated in the Mediterranean and because it's indigenous to warmer climates, the major flavor components remain stable in heat and can stand up to the drying process. This allows dried thyme to retain much of its original flavor. Thyme is heavily used in French cooking and is also the main component of herbes de Provence. Provence is a region in southeast France that borders Italy and the Mediterranean sea. The area is best known for culinary specialties that include bouillabaisse, ratatouille, and pissaladiere, and the herb mix, herbes de Provence. The cuisine is heavily influenced by Spanish, Mediterranean, and Italian flavors and features a prominent use of olive oil, herbs, and tomatoes. Chicken provencal is a French country dish of roasted (or braised in this case) chicken with garlic, tomatoes, and olives. Cook's Illustrated suggests cooking this in the oven, but I didn't feel like heating up the oven so I simmered it on the stovetop. If you wish to cook it in the oven, preheat it to 300ºF and adjust the oven rack to the lower-middle position. Heat 1 tsp of olive oil in a Dutch oven over medium high heat. Cook the chicken thighs in batches (4 at a time if you’re cooking 8, since I was cooking 6 small thighs, I squeezed them all in there). Add the thighs skin side down and cook until the skin is crisp and golden brown, about 5 minutes. At first the skin will stick to the pot but when they start to brown, they'll release easier from the pan. Turn the thighs over and brown the second side until golden brown, another 5 minutes. Remove the chicken thighs and set aside. Drain all but 2 tsp of fat from the pot. Add the onions to the pot and cook over medium heat until browned, about 4 minutes. Add the garlic, anchovy, tomato paste, and cayenne and cook until fragrant, about 30 seconds to 1 minute. Add the wine and scrape up the brown bits and then add the chicken broth, tomatoes, thyme, bay leaf, and herbes de Provence (if using). Remove the skins from the chicken thighs and nestle them into the pot with any accumulated juices. Bring to a simmer then either cook in the oven at 300ºF for about 1 hour or barely simmering over low heat for an hour. Remove the chicken and set aside and discard the bay leaf. Cook the contents in the pot over high heat until thickened and reduced, about 5 minutes. Stir in olives and cook for 1 minute. Then off heat stir in the parsley and lemon zest and spoon the sauce over the chicken. Serve with crusty bread. This will be my entry for Weekend Herb Blogging, hosted this week by Rinku from Cooking in Westchester. 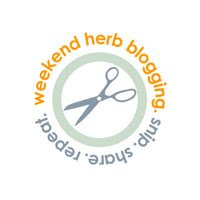 Weekend Herb Blogging is an event created by Kalyn of Kalyn’s Kitchen that encourages bloggers to share recipes and information about herbs and plants. I had lemon thyme once in my garden, but now I have a variety called silver thyme, which I like a lot. I agree, all the herb varieties can be confusing. This sounds like a tasty dish. I think thyme is so great with chicken. Amy, I want that bowl of delicious chicken with that nice slice of bread on the side - that would be THE perfect lunch for me today! I did not know there are so many different kinds of thyme too. I only keep dried basil and oregano in my pantry. I can't find any situation to use lots of herbs so I dare not buy anymore on herbs (like thyme) cos it will end up under-utilized again :( ....I still have not get hold of dill, rosemary and now there's thyme. If I only had a herb garden like you....haiz...cannot even talk about (future) for me. amy, chicken looks delicious. I didn't know there were several different varieties of thyme! I wonder if all of the varieties taste similar...are all edible? remember I got the "ginger mint" thinking it was an edible mint? and really, its for tea and hair rinse? blah! Lemon thyme sounds really interesting. I purchased the common garden/English thyme. And I agree, thyme goes very well with chicken. I used to not use any herbs, but recently I bought a bunch of dried and fresh herbs. Herbs are addicting. :D I'm keeping my fingers crossed, hopefully my plants will grow. This is almost the way I do it, so I'm sure it's delicious.